New York Rangers President and General Manager Glen Sather announced today that the club has agreed to terms with forward Dale Weise on a contract extension. Weise, 22, skated in 47 games with the Connecticut Whale of the American Hockey League (AHL) last season, registering 18 goals and 20 assists for 38 points, along with 73 penalty minutes. He established a career-high and ranked third on Connecticut with seven power play goals. He also ranked third on the team in goals, fifth in power play assists (10) and tied for third in game-winning goals (three). Weise recorded 10 multi-point performances, including back-to-back three-point efforts on March 6 at Worcester (one goal, two assists) and March 8 at Wilkes-Barre/Scranton (three assists). His three assists on March 8 marked a single-game career-high. Despite losing part of his 2010-11 season to injuries, Dale Weise managed to score 38 points in 47 games with the Connecticut Whale. 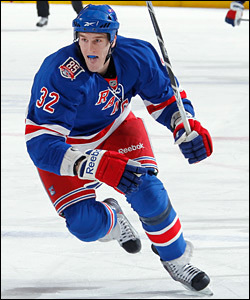 He also spent roughly a month of the season with the Blueshirts after being called up for his NHL debut on Dec. 18. Weise also tied his professional career-high with a six-game point streak from January 25 vs. Providence to February 13 at Providence, registering nine points (four goals, five assists) over the span. In Calder Cup Playoff action, Weise recorded two goals and one assist in five contests with Connecticut. Weise was assessed a fighting major while making his NHL debut on December 18 at Philadelphia. He registered 19 penalty minutes in 10 games with the Rangers last season. He was credited with a team-high, seven hits and logged a season-high, 12:53 of ice time vs. Toronto on January 19. Weise posted a plus or even rating in nine of his 10 contests, and skated in seven consecutive games from January 1 at Tampa Bay to January 13 vs. Vancouver. The 6-2, 210-pounder has skated in 194 career AHL contests with the Hartford Wolf Pack/Connecticut Whale, registering 57 goals and 54 assists for 111 points, along with 251 penalty minutes. In 2009-10, Weise established career-highs in goals (28), assists (22), points (50), penalty minutes (114), shorthanded goals (five), and game-winning goals (seven), and tied his career-high with a plus-eight rating. His five shorthanded goals tied for the AHL lead that season, while he led the team and tied for fourth in the league in game-winning goals. He also ranked second on Hartford and tied for 14th in the league in goals, and ranked third on the team in points in 2009-10. Weise made his professional debut with Hartford on October 11, 2008 vs. Springfield, and recorded his first career point with an assist on October 18 at Toronto. In addition, Weise has tallied five goals and two assists in 11 career AHL playoff games with Hartford/Connecticut. The Winnipeg, Manitoba native was originally selected as the Rangers’ fourth round pick, 111th overall, in the 2008 NHL Entry Draft.